The Muqaddimah, also known as the Muqaddimah of Ibn Khaldun (Arabic: مقدّمة ابن خلدون‎) or Ibn Khaldun's Prolegomena(Ancient Greek: Προλεγόμενα), is a book written by the Arab historian Ibn Khaldun in 1377 which records an early view of universal history. Some modern thinkers view it as the first work dealing with the philosophy of history or the social sciences of sociology, demography, historiography, cultural history, social Darwinism, ecology, Darwinism, and economics. 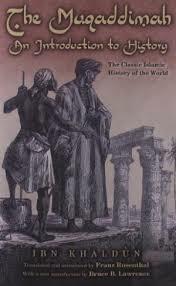 The Muqaddimah also deals with Islamic theology, political theory and the natural sciences of biology and chemistry. الكتاب من تأليف عبد الرحمان بن خلدون وتحقيق أبى عبد الرحمان عادل بن سعد. نشر سنة 2006 عن طريق الدار الذهبية للطبع والنشر.